First slide is from Necina's introduction. The rest are selected from Dr. Yuxi Li's speech. 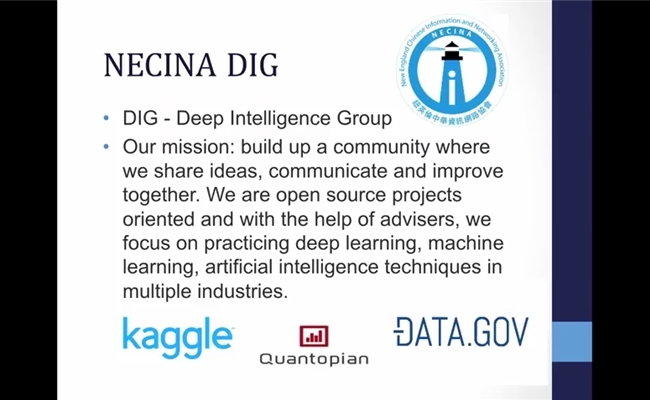 On April 2nd, NECINA DIG successfully co-hosted with MIT ETF the seminar of "AlphaGo - Key Techniques and Their Application". Over 100 audience members including students, professionals and experts in the field gathered in the MIT meeting room, along with another 100, who participated in our webinar. After a short introduction of NECINA, speaker Dr. Yuxi Li briefly showed the history of AI in game competition, from Deep Blue vs Garry Kasparov in 1997 to AlphaGo vs Lee Sedol in 2016. It took almost 20 years for the computer program to gain the ability to beat a professional Go player after it conquered Chess. Dr. Yuxi compared the search space and computation power required by Chess and Go and illustrated the algorithms running behind AlphaGo. He then covered various fundamental concepts and knowledge of machine learning and went deep in topics of the neural network, deep learning, and reinforcement learning, specifically deep neural networks and Monte Carlo tree search which is used in AlphaGo. Then he gave us some examples of AI application in other areas such as image recognition, natural language processing, drug discovery, self-driving car, option pricing, and energy management. Finally, Dr. Yuxi listed some current challenges and open problems in this field. Many people asked questions in Q&A session and the discussion continued even after the seminar. Overall, this was a very successful seminar and many valuable and informative resources and insights could be found in the 45 slide presentation. Both audience and speaker enjoyed the time and are looking forward to future events.